Assets up for sale also include PC brands Rise of Nations and Rise of Legends. The state of Rhode Island is slated to sell off the assets of the late 38 Studios at an online auction on Nov. 14. The most prominent of these is the rights to the beleaguered Kingdoms of Amalur IP. Also included are the rights to PC strategy titles developed by 38 Studios subsidiary BIg Huge Games, Rise of Nations and Rise of Legends. And if anybody wants the rights to Catan, the Xbox Live version of board game Settlers of Catan, you can get that too. 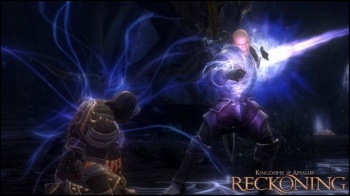 The purchaser of the Amalur IP will get the rights to unreleased MMO "Project Copernicus" as well as the action-RPG Kingdoms of Amalur: Reckoning, along with the rights to create any sequels to that game. Additional assets, such as fame concepts, artwork and designs, will be included with the Amalur purchase. There are certainly fans of the IP out there, as Reckoning was fairly well received and sold a fair share of units, so this auction may be their best hope for a follow-up. The auction will start at 9 a.m., Nov. 14, ending 12 p.m. Nov. 15. Rhode Island came to own the Amalur and other IP after 38 Studios defaulted on a several million dollar loan to move the studio to Rhode Island.